England captain Geva Mentor says she has "unfinished business" and has no plans to step down. 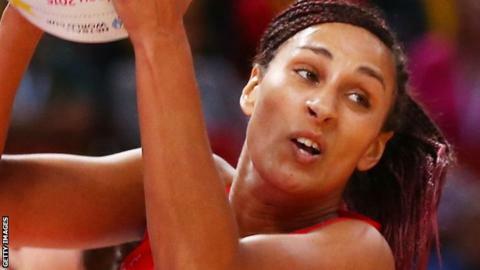 Mentor, 30, led England to a bronze medal at the recent World Cup in Australia after taking over as skipper from Pamela Cookey. "If I feel I am an asset to the team then I would love to jump on the bandwagon again," Melbourne-based Mentor told BBC Radio Solent. Making her England debut at 16, she has made over 100 England appearances. Despite her intention to carry on, she indicated she may take some time away from the game to rest. "It may mean a bit of a year off to recuperate and if I still feel I can contribute to a high level, then I'd love to be involved in the next Commonwealth Games and then a home World Cup," she said. Despite winning the third-place play off against Jamaica at the World Cup, 12 months after being defeated in a bronze-medal match at the Commonwealth Games, Mentor says she was disappointed with England's overall performances. "We really wanted to make the gold medal final, but the most disappointing thing is that the performance was lacking throughout the tournament," she explained. "It was only in the last game, against Jamaica, that we finally put out a performance that was worthy of where we're at as an England side." Mentor praised the courage of England head coach Tracey Neville for the way she dealt with the loss of her father Neville during the tournament. "One thing that Tracey brought to the team was her courage with the way that she held herself together and we had to take great strength in that," she added. "She was inspiring with the way that she dealt with it all and I can't imagine what she was going through deep down inside."